(Nanowerk News) Researchers have discovered an exoplanet just slightly bigger than Earth and located much closer to our Solar System than any other terrestrial, alien world. Called GJ 1132b, it orbits a tiny red, dwarf star just 39 light-years away. Though too hot for life, GJ 1132b is large relative to its close-by star, which nevertheless makes it an ideal planetary laboratory. The exoplanet will likely be one of the first targets of the James Webb Space Telescope, Hubble's successor launching in 2018, thereby serving as a Rosetta Stone for future characterizations of small, potentially livable worlds. "To get a really complete picture of what exo-worlds are like, we need to focus on nearby, transiting planets, such as GJ 1132b. 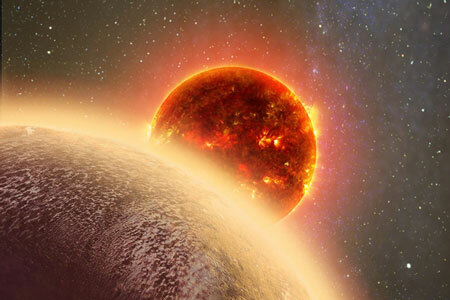 We can measure their sizes and their masses, their orbits and their atmospheres," said Zachory Berta-Thompson, a Torres Fellow for Exoplanetary Research at the Massachusetts Institute of Technology's Kavli Institute for Astrophysics and Space Research (MKI). Berta-Thompson is the lead author of Nature paper on GJ 1132b, published this week, and is part of the MEarth Project, which turned up GJ 1132b as it was monitoring nearby red dwarfs for exoplanet transits. He was one of three astrophysicists who spoke to The Kavli Foundation about the discovery, and what they may encounter when they get a closer look at the planet. Although almost 2,000 exoplanets have been cataloged since astronomers found the first worlds around other stars in the early and mid-1990s, GJ 1132b is a real standout. It was detected because it transits, or crosses, the face of its star. During these transits, starlight filters through GJ 1132b's atmosphere, bearing telltale markers of its composition. "There are many exoplanet discoveries... But the majority of those planets orbit stars that are very far away and very large. Those two factors contribute to making it difficult to actually understand what the properties of a planet are," said Elisabeth Newton, a co-author of the Nature paper, a member of the MEarth Project and a graduate student at the Harvard-Smithsonian Center for Astrophysics. "GJ 1132b is three times closer to us than any other Earth-sized planet we know of, and it orbits a small red dwarf star that is just one-fifth the size of the Sun. So that's one of the reasons why this discovery is unique." Studying GJ 1132b in detail will help answer key questions about the chances for life to take hold on planets around red dwarfs, which make up about four out of every five stars in the galaxy. These stars are cool compared to Sun-like stars, so their habitable zones--wherein surface water can remain liquid--are very close to their host stars. This proximity means that these worlds might be blasted by deadly radiation from solar flares, especially when their red dwarf stars are young. These planets are also likely to become "tidally locked," always presenting one hemisphere to their star. The facing hemisphere roasts in perpetual day as the other hemisphere freezes in a permanent night. "Because GJ 1132b is orbiting a star that's very different from the Sun, the planet is undergoing very different geophysical processes as it evolves," said Rory Barnes, a research assistant professor in the Department of Astronomy and Astrobiology Program at the University of Washington who was not involved in the study. "The planet will probably be one of our first opportunities to understand some of these processes happening on planets around red dwarfs."